What possible connection could there have been between George H.W. Bush and the assassination of John F. Kennedy? Or between the C.I.A. and the assassination? Or between Bush and the C.I.A.? For some people, apparently, making such connections was as dangerous as letting one live wire touch another. Here, in anticipation of the 50th anniversary of the JFK assassination in November, is the first part of a ten-part series of excerpts from WhoWhatWhy editor Russ Baker’s bestseller, Family of Secrets: The Bush Dynasty, America’s Invisible Government and the Hidden History of the Last Fifty Years. The story is a real-life thriller. When Joseph McBride came upon the document about George H. W. Bush’s double life, he was not looking for it. It was 1985, and McBride, a former Daily Variety writer, was in the library of California State University San Bernardino, researching a book about the movie director Frank Capra. Like many good reporters, McBride took off on a “slight,” if time-consuming, tangent – spending day after day poring over reels of microfilmed documents related to the FBI and the JFK assassination. McBride had been a volunteer on Kennedy’s campaign, and since 1963 had been intrigued by the unanswered questions surrounding that most singular of American tragedies. 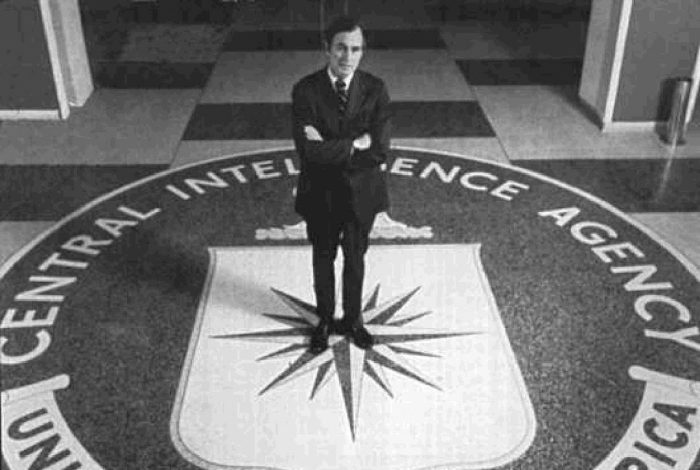 Now Ford had named George H. W. Bush to take over the CIA. But Bush seemed wholly unqualified for such a position – especially at a time when the agency was under maximum scrutiny. He had been U.N. ambassador, Republican National Committee chairman, and the U.S. envoy to Beijing, where both Nixon and Henry Kissinger had regarded him as a lightweight and worked around him. What experience did he have in the world of intelligence and spying? How would he restore public confidence in a tarnished spy agency? No one seemed to know. Or did Gerald Ford realize something most others didn’t? Meanwhile, the CIA’s Basso told reporters that the agency had been unable to locate the “other” George Bush. The assertion was reported by several news outlets, with no comment about the irony of a vaunted intelligence agency – with a staff of thousands and a budget of billions – being unable to locate a former employee within American borders. With the election only two months away, and a growing sense of urgency in some quarters, George William Bush acknowledged under oath – as part of a deposition in a lawsuit brought by a nonprofit group seeking records on Bush’s past – that he was the junior officer on a three- to four-man watch shift at CIA headquarters between September 1963 and February 1964, which was on duty when Kennedy was shot. “I do not recognize the contents of the memorandum as information furnished to me orally or otherwise during the time I was at the CIA,” he said. “In fact, during my time at the CIA, I did not receive any oral communications from any government agency of any nature whatsoever. I did not receive any information relating to the Kennedy assassination during my time at the CIA from the FBI. Based on the above, it is my conclusion that I am not the Mr. George Bush of the Central Intelligence Agency referred to in the memorandum.” . . .
Devine’s role in setting up Zapata would remain hidden for more than a decade – until 1965. At that point, as Bush was extricating himself from business to devote his energies to pursuing a congressional seat, Devine’s name suddenly surfaced as a member of the board of Bush’s spin-off company, Zapata Offshore – almost as if it was his function to keep the operation running. To be sure, he and Bush remained joined at the hip . . . In fact, Devine had little to complain about. At the time, although I was aware that he seemed to be confirming that he himself had been in the ”game,” I did not understand the full extent of his activities in conjunction with Bush. Nor did I understand the heightened significance of their relationship during the tumultuous event of 1963, to be discussed in subsequent chapters. There are 118 comments Our Comment Policy: Keep it civilized, keep it relevant, keep it clear, keep it short. Please do not post links or promotional material. We reserve the right to edit and to delete comments where necessary.